Unlike the rest of the house, a children’s bedroom must be a place for them to feel safe and comfortable as kids spend so much time there. The approach to decorating children’s rooms has changed recently, and it is accepted that the decoration can be significantly different to the rest of the house. 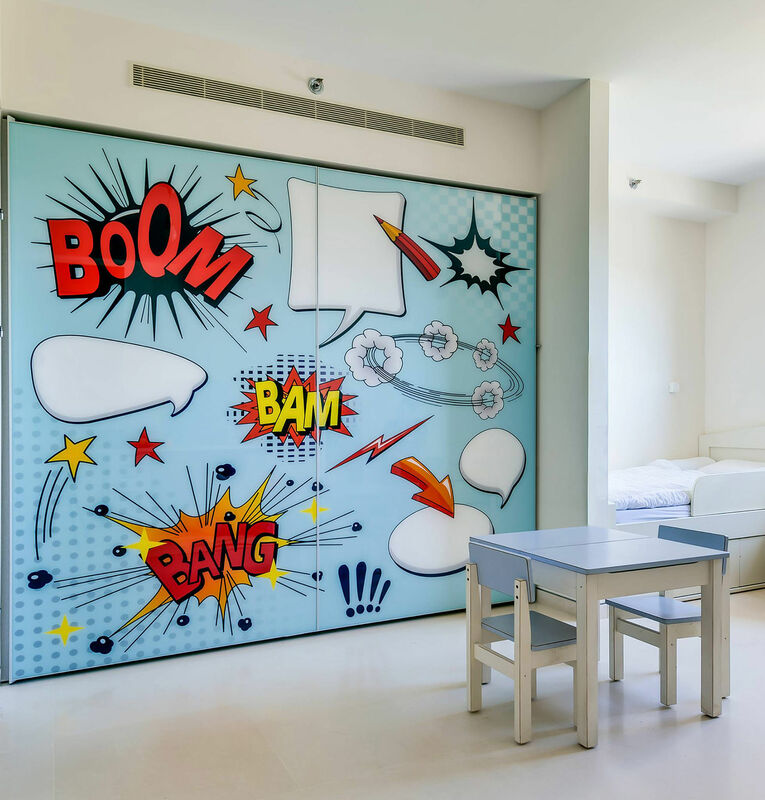 Children’s bedrooms have become separate design entities with space for sleep and play. For this project we chose a ‘floating” level sliding wardrobe, with two doors each three meters high. The wardrobe was built into an existing niche with a false ceiling. Among the many advantages of Hardoor’s innovative mechanisms is the fact that the doors close perfectly level with one another creating a clean and unfettered look. In addition, it is possible to swap sides allowing unlimited access to every corner of the interior space of the wardrobe. As the doors are hung on the outside of the body of the wardrobe, the volume of space inside is increased dramatically. The wardrobe is finished with especially thin profiles (4mm) adding to the clean, subtle finish. We decided to add a colourful comics style print furnishing a unique young and personal expression which cannot easily be ignored.